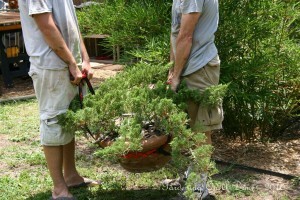 We found a product at one of the larger nurseries about a year or so ago. 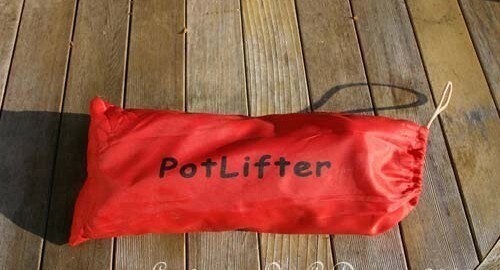 It’s called a “PotLifter”. 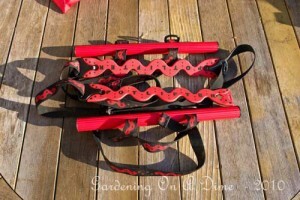 It is a strap and handles harness that makes it a lot easier to move large pots, containers, logs, or bags of potting mix. We’ve used it to move concrete pots. Perhaps in other parts of the country it is better known, but we haven’t found many places in our area that carry it……yet. 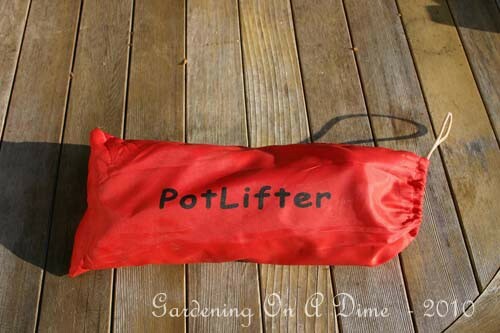 This product could become very popular with gardeners. 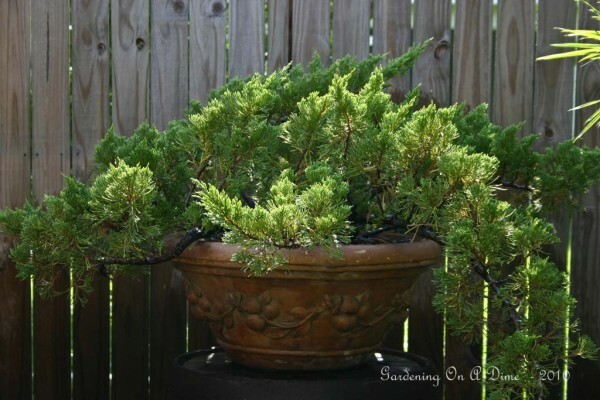 The juniper bonsai pot, shown here, is solid concrete and weighs in excess of 100 pounds. Speaking of this pot, we found this in the broken/clearance yard in an area nursery. It was a Gardening on a Dime type purchase. (Recycle by reusing, at an economical price.) With nothing wrong with it, we figured it was too heavy for them to sell or keep moving around. Basically, the guy working the yard wanted help to load it up into anybody’s truck to get rid of it. We became “anybody”. We left knowing that we had just received a great deal, even if we still didn’t know how we were going to move it around. As soon as we got it home, our PotLifter was put thru another test. It’s a fairly simple design. Two straps are easily snapped under the rim of the pot. 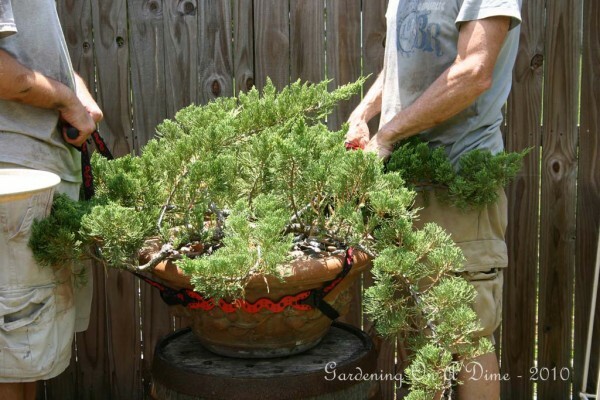 When two people lift the handles together, equal tensioning pulls on both sides of the pot. From there, you just lift it up, move it to wherever and sit it down. No dragging, no trying to load into a wagon, no balancing on a two wheel hand cart. Lift it, move it, sit it down…..All done! If we had to make a list of the top tools that were a must in our backyard, this would probably be in the top five. It’s not often that we find a product that delivers more than it promises. Nowadays, most everything can be purchased everywhere. But know that if you purchase anything by going to Amazon from this website, you are helping two folks enjoy the best life has to offer. 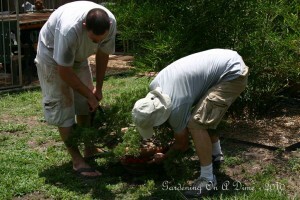 Living lots of life outdoors, enjoying gardening. We have this thing. Very helpful. Nice tool! When my honey can no longer lift for me, I’ll give it a try! Now he’s the best tool in the shed. I’ll keep it in mind. ….and it’s bright color makes it easy to find in the yard.